A 2-year-old boy was referred for an ophthalmologic opinion, and to establish the presence of uveitis. He had been born 3 weeks pre-tenn, of unrelated Caucasian parents, and experienced no perinatal problems. A rash on his face, arms and legs, was noted within 1 hour of birth, and this persisted throughout infancy and childhood. The rash was red and blotchy, and worse in warm weather. There was a family history of psoriasis. The rash was thought to be urticaria! and treated with prednisolone and aspirin from 6 months of age. A later skin biopsy revealed a chronic neutrophilic and lymphocytic response. It was noted that plasma histamine levels were very high, plasma Ig E levels very low, but Cl esterase inhibitor levels normal. He also was found to have a mild iron deficiency anemia with a leukocytosis. At the age of 2, he was admitted with a painful swollen left knee, lymphadenopathy, and fever. An arthritis was noted in his left knee, followed by involvement in the finger joints, requiring intra-articular steroid injections and continued treatment with oral prednisolone. It was at this stage that he was referred for an ophthalmologic evaluation, but ocular examination was normal with no signs of uveitis. At the age of 3.5 years, after a 5-month history of neck stiffness and headaches, he was found to have papilledema. Lumbar puncture revealed an opening pressure of 25 cm of CSF. Examination of the CSF demonstrated a cellular reaction, but microscopy and culture failed to find any infective cause. A computerized axial tomogram was normal. At the time, it was felt that he was suffering from Bates syndrome (before Dr Prieur's description of the CINGA syndrome), and that he had benign intracranial hypertension secondary to systemic steroids. Later evidence of developmental delay, mood disturbance, slow learning and reporting of similar case histories, suggests that these early neurological complaints were attributable to this patient's syndrome, rather than to his steroid therapy. His chronic headaches were much improved on astemizole and he received regular physiotherapy and treatment with splints for his inflammatory arthritis. His parents reported apparent deafiiess, but evoked response audiometry was only performed on one occasion, and was normal in both ears at that time. At the age of 5, he suffered chicken pox pneumonia and encephalitis complicating his immunosuppression. He made a complete recovery from this. He had late motor development (standing by 20 months and cruising by 2.5 years) and his vocabulary was delayed. His bodily function control also was delayed, being dry during the day by 3 years and at night by 8 years. Thus, this patient had a functional delay in motor, speech, and bladder control, and perhaps hearing - a generalized delay in development that usually results in reduced abilities in all areas, so called global retardation. 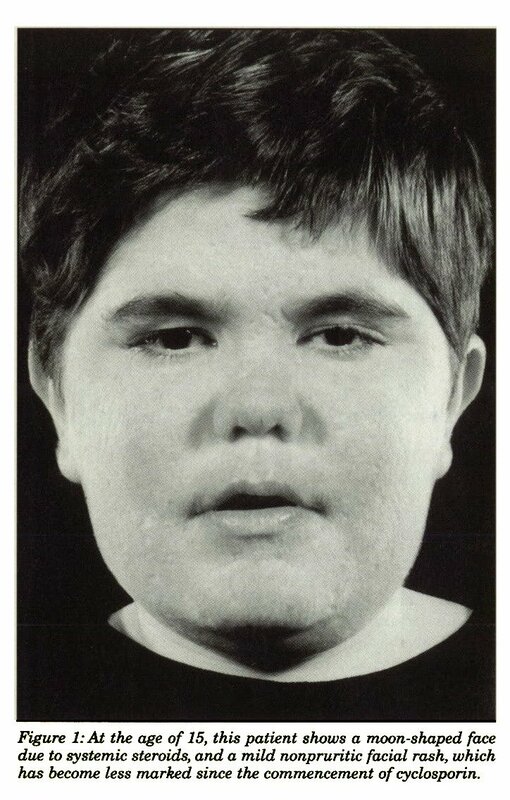 '1 At the age of 9 years, he was found to be of a small stature, 1.05 m (< 3rd percentile), and his body weight was only 22 kg (<10th percentile). His progressive growth retardation was felt to be due to a combination of arthritis and systemic steroid therapy. By age 11, he was wheelchair bound. At the age of 14, he was commenced on a trial of cyclosporin, which effected a marked improvement in his urticaria and headaches. 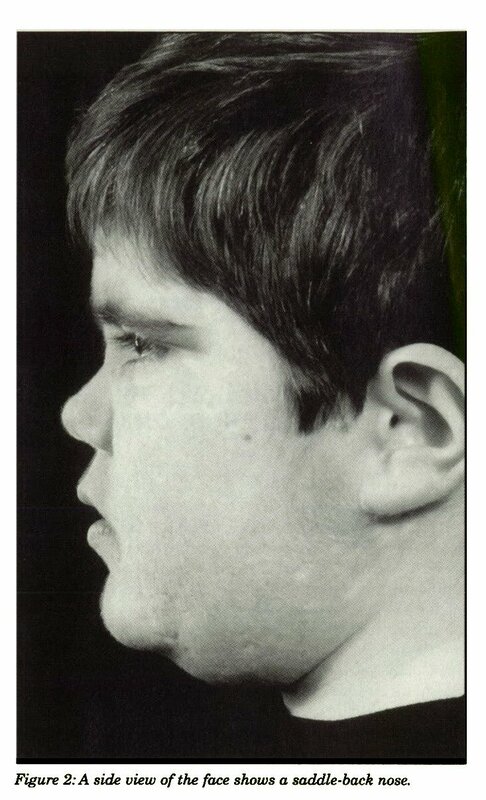 Figure 1:At the age of 15, this patient shows a moon-shaped face due to systemic steroids, and a mild nonpruritic facial rash, which has become less marked since the commencement of cyclosporin. Figure 2: A side view of the face shows a saddle-back nose. From the age of 7 years, he continued to maintain a chronic, mild, anterior uveitis in one or both eyes, which was treated with topical steroids. The iritis was nongranulomatous, typified by flare and cells, but without the formation of posterior synechiae. The uveitis resolved after starting cyclosporin at the age of 14. He also had been noted to have mild optic atrophy and mildly constricted visual fields following his papilledema. At his last ophthalmic visit at the age of 15, his visual acuity was 6/12 / N5 right and 6/18 / N8 left. His intraocular pressures were 14 mm Hg in each eye. There was a mild bilateral paralimbal corneal scarring. Both eyes were quiet. Both optic discs were slightly pale and elevated with gliosis (Figs 5 and 6). Chronic arthritides in children are often most related to JRA, but in the late 1970s and early 1980s, various cases were reported of children with arthritis and differing systemic involvement.5,6 All these and other cases were collated by Dr A. M. Prieur and her work was published in 1987 when she named this new rheumatic disorder a chronic, infantile, neurological, cutaneous, and articular (CINGA) syndrome.3 The first symptoms of the syndrome appear either at birth or in early infancy. 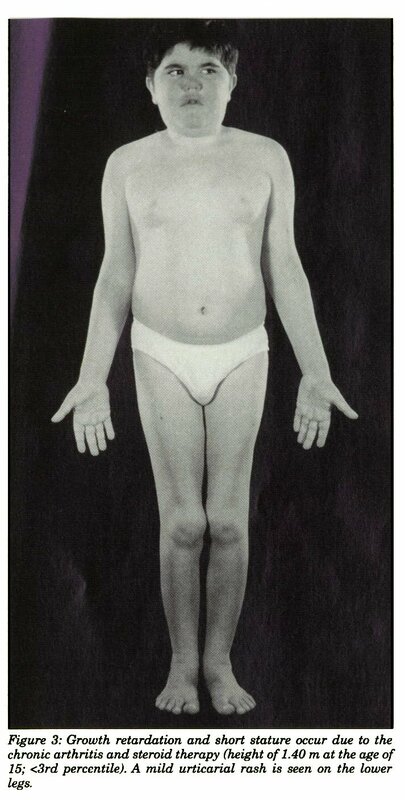 Figure 3: Growth retardation and short stature occur due to the chronic arthritis and steroid therapy (height of 1.40 m at the age of 15; <3rd perccntile). A mild urticarial rash is seen on the lower legs. 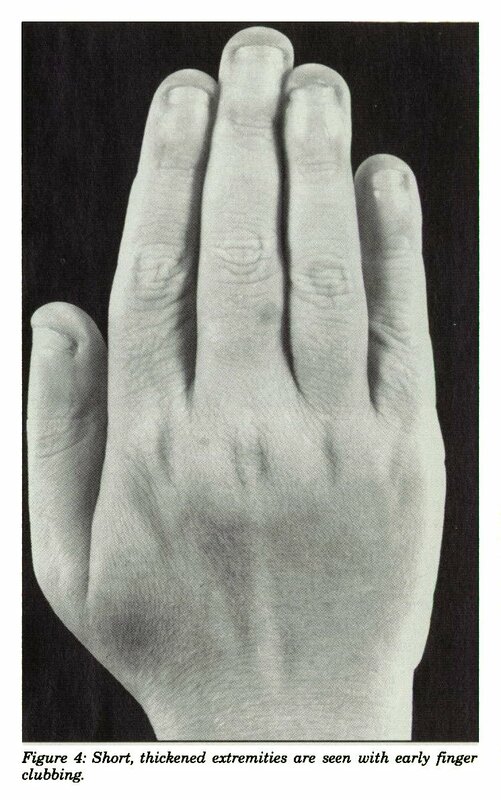 Figure 4: Short, thickened extremities are seen with early finger clubbing. This is always the first sign of the syndrome to appear. The rash is a chronic non pruritic urticaria that varies during the daytime. The rash tends to wax and wane, is present daily and is exacerbated during flare-ups of the disease (Figs 1 and 3). An inflammatory arthritis affects the knees, ankles, feet, elbows, wrists, and hands in a symmetrical distribution, to the exclusion of other joints. Fifty percent of children have mild disease, which usually starts after the age of 2 years; the remaining children have severe disease which usually starts before age 1. It can affect the epiphysis, metaphysis, and growth cartilage. It can lead to progressive contracture of the knees and elbows with joint deformity due to patella or epiphysis overgrowth. Involvement takes the form of chronic meningitis, headaches, seizures, spasticity, cerebral atrophy, and a low IQ. CSF shows an increase in cellularity (neutrophils and eosinophils) up to 300/mL and/or an increase in protein up to 250 g/dL. Obvious features include progressive growth retardation leading to short stature (Fig 3); head enlargement due to delay in closure of fontanelles, which have a fibrous consistency; a saddle-back nose (Fig 2); short and thickened extremities; and finger clubbing (Fig 4), Some show wrinkling of the gkin of the palms and soles. Figure 5: (A and B) The right and left optic discs are pale and elevated with gliosis. This includes progressive deafness (usually late onset after 6 years of age) and hoarseness. Ocular involvement eventually occurs in all patients but its cause is unclear. Almost any part of the eye may become involved and includes conjunctivitis, keratitis, uveitis, chorioretinitis, papilledema, and optic atrophy. The CINGA syndrome is a chronic inflammatory disease and the children usually have to contend with numerous flare-ups that may be associated with a fever (low grade or high spiking), splenomegaly, and adenomegaly. The earlier the joint symptoms occur, the more serious the disease appears to be. The severity of illness also correlates with prematurity and neonatal illness. Occurrence is sporadic and its incidence seems to occur more commonly in premature infants. The hallmark seems to be an eosinophilia in the blood, CSF, and soft tissues. Blood tests usually show a hypochromic anemia with a leukocytosis (neutrophils and eosinophils). The platelets, erythrocyte sedimentation rate, and acute phase reactants also are elevated. Lymphocyte and neutrophil function is normal. Complement studies show no disorder. Immune complexes are not detected in serum and most children are rheumatoid-factor negative. Plasma electrophoresis reveals a polyclonal hypergammaglobuHnemia of G, A, and M antibodies. Bone marrow biopsies usually show no anomaly but may occasionally show hyperactivity. Lymph node and liver biopsies are either normal or show chronic inflammation. JEA has its peak incidence in children from 1 to 5 years old, with a smaller peak at puberty. The systemic form occurs in about 20% of children and may not have prominent joint symptoms, but may cause a remitting fever, hepatosplenomegaly, and abdominal pain. The polyarticular form occurs in 50% of patients, with painful swelling and stiffness of both large and small joints in a symmetrical distribution. It characteristically involves the temperomandibular joints and cervical spine, as well as the limb joints, and systemic signs are minimal. The oligoarticular form occurs in 30% and is a chronic large joint disorder, usually affecting five or fewer joints, and it is this type in which ocular involvement is most important. The etiology of the CINGA syndrome is as yet unknown.3 No infective cause has been found: antibody titers, fluids and tissue cultures for bacteria, fungi, parasites, and viruses have all proved negative. A metabolic order is not sustained by aminoacid chromatography of blood and urine. No evidence of storage disease is seen in skin, bone marrow, lymph nodes, or liver, nor is there any evidence of mucopolysaccharide abnormality. Treatment is mainly symptomatic and supportive. Nonsteroidal anti-inflammatory agents are used for pain relief, but they do not seem to affect joint inflammation. Systemic steroids are given for fever and pain, but do not help the skin or the joints. Physiotherapy and joint support aid mobility, reduce dependence, and increase functional status. Although the CINGA syndrome is rare, it is a devastating condition for the patient and for the patient's family. Early recognition of the symptom complex is essential to provide support and prevent excessive investigation. Ophthalmic complications occur in all patients and, as such, all sufferers become regular eye clinic attendees. It is the role of the ophthalmologist to diagnose conditions such as keratitis, uveitis, and papilledema, and to treat these sight-threatening complications as early as possible to prevent further dependence and loss of morale. 1. American Academy of Ophthalmology. Pediatrie Ophthalmology and Strabismus. San Francisco. 1991-1992 (Basic and Clinical Science Course; Section 6). 2. Hallett JW. Disorders of the Uveal Tract. In: Harley RD, ed. Pediatrie Ophthalmology. Philadelphia, Pa: WB Saunders Co, 1975: 326-346. 3. Prieur AM, Griscelli C, Lampert F1 et al. A chronic, infantile, neurological, cutaneous and articular (CINCA) syndrome. A specific entity analyzed in 30 patients. Scand J Rheumatology. 1987(suppl 66):57-68. 4. Hull D, Johnston Dl.Essential Paediatrics. (1st ed.) London: Churchill Livingstone, 1981:305. 5. Ansell BM, Bywaters EGL, Elderking FM. Familial arthropathy with rash, uveitis and mental retardation. Proc R Soc Med. 1975;68:584. 6. Prieur AM, Griecelli C. Arthropathy with rash, chronic meningitis, eye lesions and mental retardation. J Pediat. 1981; 99: 79-83. 7. American Academy of Ophthalmology. Intraocular Inflammation and Uveitis. San Francisco; 1991-1992 (Basic and Clinical Science Course; vol Section 9).